8×8 vehicle for Santa, capable of operating no both land & water. 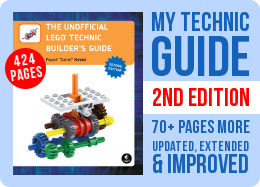 Features full independent suspension and LEGO Christmas tree baubles used as wheels. A simple build of the “creative use of LEGO pieces” variety. 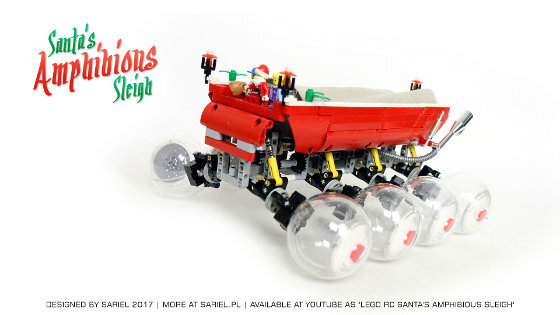 It was a new take on my last year’s motorized Santa’s sleigh – this time it was supposed to move both on land and water. The key for making it work was the use of LEGO baubles commonly found in Christmas tree ornament sets – these are large trans-clear hollow baubles consisting of two halves that close up together. I have first noticed such a bauble at the airport in Billund, Denmark, when visiting the LEGO House a few months ago, and my first thought was: I wonder how well it floats on water. The baubles are actually taped shut when sold, with pieces for the set inside, so the tape has to be removed in order to take the pieces out, and the baubles are not 100% watertight without the tape. Once I have tested one bauble and found it able to float with a lot of weight on it (even if slowly taking water), I have bought another seven baubles and proceeded to use them as wheels for a 8×8 vehicle. The vehicle itself was dead simple, since it couldn’t be too heavy. It used simple Tatra-like independent suspension for all “wheels”, with 8 shock absorbers positioned springs-up to avoid getting the springs wet. There were two driveshafts, one for the four left “wheels” and the other for four right ones. 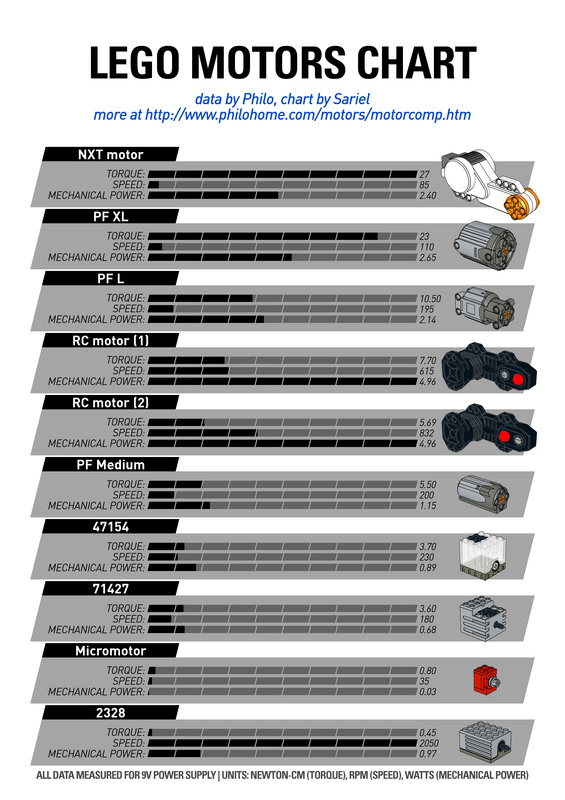 Each driveshaft was driven by a single PF M motor geared down 2.779:1. Each bauble was connected to an axle using a complex LEGO-built adapter that connected to the pinhole on bauble’s top, originally meant for a ribbon to tie the bauble to the Christmas tree. Just like in my previous Santa’s sleigh, I have used a piece of canvas to cover vehicle’s top, saving a lot of weight and making it possible to hide the PF IR receiver under the canvas (since it was easily penetrated by the IR signal). Because the baubles were perfectly round and smooth, they had minimal rolling resistance compared to LEGO tires, and the vehicle was actually very agile even with the weak PF M motors. Surprisingly, it also had enough traction to overcome simple obstacles such as a folded rug. The traction proved insufficient in snow, obviously, where the round balls had no way of getting a grip. When on water, the vehicle was also propelled by rotating the baubles. I have experimented with adding small propellers to the two driveshafts, but it actually made no real difference to how the vehicle operated on water. So I went with just using the baubles, which were slow but a fairly accurate means of controlling the vehicle’s movement. As mentioned above, because I didn’t tape or glue the baubles, they were slowly taking water and the vehicle could stay in water for 3 to 4 minutes at a time before is started sinking rapidly. After that time, it needed to be taken out and the baubles had to be emptied. It was a simple, but very enjoyable build. Not pretty to look at, but fun to operate and performing surprisingly well. My only regret is that it was pretty much useless in actual snow.